In retrospect, my teenage years weren't exactly horrific. They weren't all great granted, there were ups and downs but some of them were actually pretty awesome. Who'da thought that when your parents told you 'your school days are going to be some of the best years of your life' they were actually telling the truth? 1. Don't dye your hair black. Just don't do it. This one's pretty self-explanatory from the above picture (back when I used to over-expose my selfies so much that my nose would disappear). I was far too pale to carry off black hair and it only washed me out further, not to mention it was an absolute ballache to get out when I eventually did want a different hair colour - but of course I was 17 and too sassy to be listening to anybody but myself. I had that hair colour from the ages of 15-19. I eventually grew out the fringe and started wearing it in an unkempt, 'I'm not sure where my parting is' fashion - only to then earn the nickname 'Bella' from my apparent resemblance to Kristen Stewart. You can't win everything I guess. 2. It's ok to not know what you want to do with your life. I think this is one of those statements that we'd all like to go back in time and tell our teenage selves. Don't know what career to choose? that's ok. Don't know what subjects to take at college/uni? that's ok too. Teachers/parents/peers put an enormous amount of pressure on - essentially - children to make decisions that are going to effect the rest of their lives. At 16, when you've got exams/coursework/skin issues/body image/boys on your mind as well, it can be alot to be getting on with. The main thing I'd tell myself - do what you enjoy, the rest will follow. 3. STOP abusing the black eyeshadow/eyeliner. 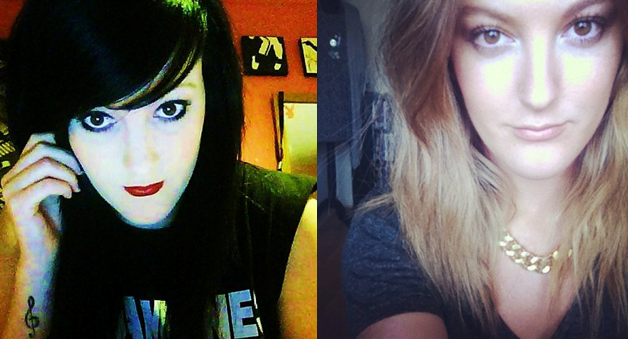 This, for me, is the thing I cringe most about when I look back on past pictures of myself - how much black eyeshadow/eyeliner I wore! The worst part was I distinctly remember thinking how cool I looked. I did NOT look cool - and I didn't even have that gothy/emo phase to disguise this unfortunate makeup mishap. If I was to go back in time, I'd steal all of the black eyeshadow I ever owned. 4. Don't expect your life to turn out exactly how you've planned it. Life doesn't work that way. And that's ok. If everything turned out exactly how we wanted it all the time, life would be pretty darn boring. I'd tell myself set yourself ONE goal each time, and achieve that before aiming for something else. It's much easier than setting yourself umpteen goals and being able to achieve none because you're taking too much on and trying to please too many people. Live your life for you because in the end, that's who has to deal with it. 5. Friends will come and go. I have exactly one - yes, one - friend who I've continued to stay in touch with since high school/college. Obviously I've made other friends since leaving education and I have a pretty solid support system of them nowadays. Unfortunately, growing up I wasn't so lucky. In high school/college, friends are fickle. Teenagers are ridiculously impressionable and gullible to say the least and will change their minds about a person/thing/event at the slightest provocation. This isn't exactly a terrible thing - it all stems from an adolescent's insatiable desire to fit in with their peers so they'll do anything to please them. I'm not saying be awful to everyone because they're not going to stick by you. They might, and I hope they will - but what I am saying is don't wear your heart on your sleeve, that's the easiest way to get it broken. I abused eyeshadow (not black) but eyeshadow, I'd just smother it on my my face and look like a clown. I also had foundation a few shades darker than my skin colour. Sigh. I'm still a teenager for 3 months! But, I'm talking about my 13-18 year old self. I wish I told myself friends would come and go, I made too much of an effort trying to fit in and keep horrible friends. Thanks for the nice read! thank you for taking the time to read it! NEVER dye your hair black - one of the worst mistakes of my life! hahah! Every single bit of this advice I would have told myself, as well! It's so easy to see what you should have done in previous years, but at the time, all the decisions you were making you thought were right. I would add: It really does get better. Great post, made me laugh. Agreed, dyeing your hair pitch black isn't the best idea... Well at least you didn't try to cut your own fringe. x.